A unique method to avoid an above knee amputation in a patient with chronic tibial osteomyelitis. Department of Orthopaedics, Rutgers – New Jersey Medical School, 140 Bergen Street, D level, Newark, NJ 07103. Introduction: Chronic osteomyelitis is a disease that requires fastidious treatment to eliminate. However, when eradication is unable to be achieved through exhaustive modalities of antibiotic therapy and multiple debridements, significant resection of the infected bone and soft tissue must be considered, including amputation. 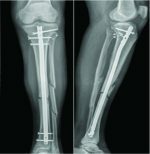 Here we report of a salvage procedure for chronic osteomyelitis of the left tibia by employing a rotationplasty to avoid an above knee amputation and instead provide the patient with a below knee amputation. 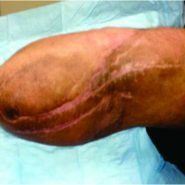 Case Report: A 51-year-old male presented to the emergency department after noticing dehiscence of an operative wound with exposure of an implant in the left lower extremity. Two years prior to presentation, the patient was involved in a motorcycle accident and underwent four surgeries in the Dominican Republic for an open fracture of the left tibia and fibula, including a procedure that involved the placement of an implant in the left proximal tibia. Tissue biopsies from the wound confirmed that the patient had osteomyelitis of the left proximal tibia. After extensive surgical and antibiotic intervention to eradicate the patient’s osteomyeltis, it was eventually determined that an amputation would be necessary. In order to avoid an above knee amputation, a salvage procedure was conducted by employing a rotationplasty to provide the patient with a below knee amputation. Conclusion: When amputation is deemed necessary, sparing the knee joint is associated with decreased energy expenditures, increased patient satisfaction and overall better postoperative outcomes. As part of a multi-disciplinary team, orthopaedics, plastic surgery, infectious disease, and medical services successfully treated this case of chronic osteomyelitis of the left proximal tibia by employing a rotationplasty to avoid an above knee amputation and achieve a below knee amputation. Osteomyelitis is an infection of bone tissue that may occur due to bacteremia, spread of local infection, or, as seen in this case, open fractures brought on by traumatic injury . It has been estimated that as many as 50,000 hospital admissions occur each year due to osteomyelitis [6, 3] and the mortality rate of this disease has been estimated to be about 2% . Chronic osteomyelitis, which is characterized by infected dead bone and a prolonged, persistent infection, is particularly difficult to eradicate completely and often requires surgery . Current treatment indications for this type of infection include debridement, aggressive antibiotic treatment, negative pressure dressings and skeletal stabilization (such as an external fixator) . However, if these methods fail, amputation must be considered and may be preferable to recurrent operations and prolonged antibiotic treatment . Lower-limb amputation is one of the most ancient and prolific surgical strategies employed to treat a wide array of ailments including infection, trauma, and cancer. It has been indicated in chronic osteomyelitis, particularly when multiple debridement operations and extensive antibiotic therapy have proven unsuccessful [4, 3]. However, one of the major concerns regarding amputation involves post amputation function of the limb. Above knee amputations are known to significantly increase energy expenditure during the gait cycle and negatively impact rehabilitation when compared to below knee amputations . Therefore, when considering amputation, it is important that the amputation be performed at the lowest level possible in order to preserve the maximum level of function and gait efficiency [19.4]. In this case, the patient R. A. would require an amputation in order to eliminate a very persistent and aggressive case of osteomyelitis of the left tibia secondary to open fractures of the left tibia and fibula. However, R. A. had acquired a segmental bone defect that left his proximal tibia at 2.5 cm (Fig. 1), which is too short to properly attach prosthesis post-amputation. When a post-surgical stump in a below knee amputation measures less than 3 cm, function of the limb is compromised and a below knee amputation is no longer feasible . However, it was determined that a rotationplasty could be conducted in order to extend the length of the amputation stump and maintain a functional knee joint that would allow for the application of a prosthesis. Rotationplasty is a limb sparing technique that enables amputation of compromised lower limb tissue, while maintaining the functionality of the knee joint. During the classic rotationplasty, the knee joint is resected and the distal leg is rotated 180° and attached to the distal femur so that the ankle joint may serve as a functional knee joint after attachment of a prosthesis [4, 3]. Rotationplasty is commonly indicated in osteosarcoma of the distal femur but has shown to be a useful alternative to above knee amputations in other limb salvaging strategies as well . 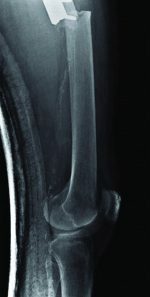 Our case report describes a rotationplasty of the distal bone and soft tissues of the leg that preserved the native knee, allowing for a below knee amputation of optimal length for a patient with chronic osteomyelitis of the midshaft tibia. R. A. is a 51 y/o male with a history of uncontrolled, non-medicated diabetes and a 20 pack-year cigarette habit who presented to the emergency department on July, 17 2011 with fibrinous discharge from a 5 x 3 cm wound in the left lower extremity. The patient was involved in a motorcycle accident in 2009 in the Dominican Republic that resulted in open fractures of the left tibia and fibula. He subsequently underwent four surgeries in the Dominican Republic on the left lower extremity, including a surgery that involved placement of a plastic implant in the left proximal tibia (Fig. 2). After moving to the United States, R. A. presented to the Emergency Department after noticing opening of the operative site at the left proximal tibia and exposure of the plastic implant with associated discharge. Upon physical examination, R. A. was noted to have a 5 x 3 cm wound about the anterior aspect of the left proximal tibia. The wound extended through the associated soft tissues of the limb and a cement spacer implant, which was used to fill the bone void at the left tibia during a previous surgery in the Dominican Republic, was visible (Fig. 3). Much of the anterior portion of the spacer was exposed to air. There was fibrinous exudate around the injured area but no frank erythema. Soft tissue examinations of the injured area demonstrated decreased attenuation and edema in the tibialis posterior muscle. It was noted that there was periostial new bone formation about the margins of the distal tibial fragment. Evaluation of the left fibula demonstrated non-unioned fracture in the proximal third fibular shaft. On July 20, 2011 R. A. underwent surgery on the left lower extremity, which included irrigation and debridement, intraoperative deep tissue biopsy, removal of the plastic spacer implant, insertion of antibiotic beads, and insertion of an antibiotic spacer at the site of the segmental defect of the proximal tibia. The segmental defect length was approximately nine cm, with the intact proximal tibia measuring 2.5 cm and the intact distal tibia measuring eight cm. A vacuum-assisted-closure skin graft was also placed on the open wound on the left lower extremity by the Plastic Surgery Department. Deep tissue biopsy cultures were positive for Klebsiella pneumoniae and Pseudomonas aeruginosa. Post surgery, R. A. was placed on zosyn (3.375g per IV every 6 hours) and vancomycin (1g per IV every 12 hours) antibiotic medication before being switched to meropenum (500mg every 6 hours) and vancomycin (1.25g every 12 hours) on July 23, 2011 as recommended by the Infectious Diseases Department. Over the next two years R. A.’s chronic osteomyelitis of the tibia was treated with irrigation and debridements and antibiotic treatments. On July 24, 2011, R. A. underwent surgery again which resulted in the replacement of his antibiotic spacer, irrigation and debridement, and the removal of his antibiotic beads. On July 26, 2011, R.A.’s antibiotic medication was changed to meropenum (1g every 8 hours). On July 28, 2011, another surgery was performed to exchange the antibiotic spacer, conduct another irrigation and debridement, and conduct a saucerization of the left tibia. On August 23, 2011, R. A. received another debridement and a split-thickness skin graft. On August 30, 2011, R. A.’s antibiotic treatment was changed to meropenum (2g every 8 hours). On August 31, 2011 R. A. received an Ilizarov-type hybrid external fixator to provide stability to the left tibia (Fig. 4). For several months, R. A. was able to ambulate with crutches without weight bearing on the left lower extremity, but R. A.’s chronic osteomyelitis remained persistent and his wound continued to drain. At this time, several long-term treatment strategies were discussed with R. A. as it was decided that he had an infection that could not be eradicated without amputation of the limb. Other modalities that were initially considered were the Papineau Technique and distraction osteogenesis. The Papineau technique is a type of open bone grafting technique in which wounds are packed with cancellous bone, usually for infected non-unions. However, this requires that the wound be clean and have adequate blood supply. In addition, the white count, ESR, and CRP should have normalized and the host has a normal immune system and adequate nutritional parameters. In addition, distraction osteogenesis after acute limb-shortening for segmental tibial defects has been shown have success  however, in the presence of chronic osteomyelitis it was not a viable option for patient R.A. However, despite multiple irrigation and debridements and prolonged course of antibiotics, the continued prescience of infection made the chance for success for those modalities low. Due to the short length of his native proximal tibia, a traditional below knee amputation was not a reasonable treatment option. Other levels considered were at the through knee and the above knee level, but there was concern for the loss of function and increase in energy expenditure that accompanies an amputation performed at these levels. After deliberation, consideration was given to a rotationplasty of the distal tibia to unite it to the proximal tibia and provide the patient with a below knee amputation of appropriate length. This would be the best option to provide definitive eradication of the infection while preserving the maximum knee function possible. On June 13, 2012, R. A. underwent surgery again to remove the taylor spatial frame from the left lower extremity, conduct an irrigation and debridement, and exchange the antibiotic spacer at the left proximal tibia. Another tissue biopsy from the left proximal tibia during this surgery showed growths of Methicillin-Sensitive Staphylococcus aureus. On June 18, 2012, R. A. received another irrigation and debridement and exchange of his antibiotic spacer. On June 21, 2012, a rotationplasty was performed on R. A.’s left lower extremity. Prior to the operation, R. A. was neurovascularly intact at the foot and ankle. First, R. A’s antibiotic spacer was removed without difficulty and the surgical incision was extended distally, while poor quality skin and fine extracts were resected. Dissection of the left ankle joint was then conducted from medial to lateral, exposing tendons and neurovascular bundles. The ankle joint was then disarticulated without difficulty and the distal tibia and fibula were exposed subperiosteally 1.5 cm proximal to the plafond. A supramalleolar osteotomy was made and exposure continued proximally while the tibia was dissected. Careful attention was paid to avoid injury to neurovascular bundles to ensure that adequate blood supply to the soft tissue remained intact. The distal tibia was then measured with the goal of providing about eleven cm of bone to the below knee amputation stump site Eight cm of distal tibia was then cut and dissected from associated soft tissue and significant scar tissue. Next, the proximal part of the dissected distal tibia was osteotomized at the level of the previous fracture with special attention paid to ensure that the posterior tibial artery remained intact to maintain good blood supply to the area. After the dissection was completed, the distal flap was then turned up to the proximal leg and the connection was held in place with multiple k-wires (Fig. 5, 6).Fluoroscopic evaluation revealed good alignment of the attachment site in coronal and sagittal planes. This attachment site was then secured using a proximal humeral locking plate held in place with a combination of locked and nonlocked screws on the medial side (Fig. 7, 8). A 3.5 recon plate was placed laterally to further support this alignment (Fig. 7,8). Soft tissue closure was performed using #1 vicryl, 2-0 vicryl, and 3-0 nylon after irrigation and placement of a JP drain. Sterile dressing was placed and the patient was noted to have tolerated the procedure well. Following the surgery, R. A. was placed on IV vancomycin (1g every 12 hours) and meropenem (500mg every 6 hours). On post-operative day 1, R. A. was able to ambulate well with crutches without putting weight on the left lower extremity. On June 26, 2012 R. A. was discharged and instructed to visit the Antibiotic Infusion Clinic daily to continue his vancomycin and meropenem treatment. R. A. also followed-up frequently with the Orthopaedics Department so that his surgical wounds could be closely monitored. On July 18, 2012, R. A.’s sutures were removed from the operative site and his left lower extremity was noted to be clean and dry with no evidence of drainage or erythema. Sensation of light touch was intact at the left lower extremity and the skin was noted to be well perfused. R. A.’s range of motion at the left knee joint was 0-30 degrees and he was instructed to continue with physical therapy and to avoid bearing any weight on the left lower extremity until at least three months after the date of surgery. On August 21, 2012, R. A. followed up again with the Orthopaedics Department. His wounds were noted to be dry and intact with no drainage or erythema. His range of motion had also increased to 0-65 degrees. X-rays taken during this visit demonstrated no change in alignment or position of the stump of the proximal tibia and intact hardware at the proximal tibia with no evidence of loosening. By November 6, 2012, R. A.’s range of motion had improved to 0-110 degrees and X-rays showed a healing osteotomy site, unchanged alignment of the proximal tibia, and improved ossification. On February 21, 2013, during a follow-up with the Orthopaedics department, it was revealed that R. A. had been fitted for prosthesis but had been unable to obtain one due lack of insurance coverage. Additionally, R. A. had drainage from an area at the left distal thigh at a surgical incision site on the medial aspect of his left lower extremity. The drainage site showed no frank pus but a small amount of white drainage. The area showed no erythema and was not tender to palpation.The rest of R. A.’s surgical wounds were healing well and it was suspected that this wound was likely a superficial suture abscess and not a deep infection. R. A. was given oral clindamycin for antibiotic treatment, which ameliorated the drainage but was ceased after 12 days due to a possible allergic reaction to the medication, which caused a rash. On February 27, 2013, an x-ray showed that there was no evidence of osteomyelitis and it was noted that there was no drainage from any surgical incisions. On March 20, 2013, R. A.’s surgical incision sites were all noted to be clean, dry, and intact. On April 8, 2013 R. A.’s surgical incision sites were all well healed and there was no evidence of drainage. His range of motion was measure to be about 0-45 degrees of flexion and x-rays from this follow-up demonstrated adequate alignment at the inter-transport site. There was good incorporation of the segmental fracture and no change in alignment. On July 30, 2013, R. A. showed no signs of drainage from any of his surgical incision sites. On physical examination, R. A. was noted to have healed from the surgery well and showed no signs of wound breakdown (Fig. 9, 10). There was no erythema, drainage, or other signs of infection and the stump site was nontender to palpation. R. A.’s range of motion was noted to be 0-55 degrees of flexion and full extension at the knee joint was observed (Fig. 9, 10). There was no pain during range of motion. X-rays showed that the proximal tibia was well healed with intact hardware and no evidence of loosening (Fig. 11). It was noted that the main concern regarding this follow-up was R. A.’s inability to obtain prosthesis because he was denied access to Medicaid due to his lack of citizenship. Chronic osteomyelitis, in contrast to acute forms of osteomyeltis, generally responds worse to antibiotic and surgical intervention . Infections can last for years and are extremely difficult to eradicate, particularly when other significant medical histories are present including, as seen in this case, a history of diabetes . Diabetic patients are often at particularly high risk for osteomyelitis infections due to peripheral neuropathy and microvascular disease. These complications inhibit the body’s ability to combat soft tissue infections and allow for opportunistic infectious agents to quickly spread to neighboring bone tissue [13,10,3]. The most common cause of chronic osteomyelitis infection is open fracture [11,3] and the tibia is most frequent location of open fracture injury . Therefore, it is unsurprising that the tibia is the most frequently reported site of osteomyelitis infection [8,3]. In fact, it has been estimated that traumatic open fractures of the tibia, such as the injury reported in this case, are associated with an osteomyelitis infection rate as high as 56% [17, 3]. In this case, R.A.’s persistent infection of chronic osteomyelitis in the left proximal tibia was treated for two years with multiple debridement operations and a strict antibiotic regimen. Unfortunately, after these extensive surgical and medical interventions, the patient’s chronic osteomyelitis was unable to be eradicated and plans were made for an amputation. When considering a lower limb amputation, sparing the knee joint is of paramount importance. The advantages of below knee amputations over above knee amputations in general health, less energy expenditure, and rehabilitation outcomes are well documented. In a retrospective review of 954 lower limb amputee cases, it was concluded that above knee amputations were associated with a significantly higher percentage of perioperative cardiac events than below knee amputations (6.8% vs 3.6%) and a much shorter median survival rate (20 months vs 52 months) . Additionally, it has been shown that transtibial amputees are more likely to wear their prostheses than transfemoral amputees and distal amputation sites are associated with better prosthesis wearing rates . Patients with above knee amputations also report lower post-operative satisfaction rates than patients with below knee amputations . In a study examining 134 cases of lower limb amputation, 75% of below knee amputees compared to just 38% of above knee amputees considered their prosthesis comfortable. Additionally, it was found that only 28% of below knee amputees stated that they “felt handicapped” compared to 38% of above knee amputees . In another study examining 161 lower limb amputees, 44.4% of patients with above knee amputations, 39.2% of patients with a below knee amputations and 60.0% of patients with through knee amputations were considered “substantially disabled” as identified using the sickness impact scale (a scale which takes into account factors ranging from post-operative mobility to social interactions to measure a patient’s self-reported health) . However, after removing the influence from confounding factors, it was found that there was no significant difference between the reported sickness impact scale of below knee and above knee amputees but through knee amputees were associated with significantly higher sickness impact scores compared to both groups . Above knee amputations are also associated with much higher energy expenditures and slower mobility compared to below knee amputations during gait with prosthesis. The relative energy consumption during gait of a below knee amputee is 42% larger than non-amputee controls while energy consumption of an above knee amputee is 63% greater than non-amputees . In a study conducted at Pathokinesiology Laboratory of Rancho Los Amigos Medical Center in Downey, CA, it was found that transtibial amputees using a prosthesis had an average oxygen consumption of 0.16mL/kg/m during gait and an average chosen walking speed of 71m/min compared to 0.20mL/kg/m and 52 m/min for transfemoral amputees using a prosthesis . When performing a lower extremity amputation, the importance of sparing the knee joint cannot be overstated. However, it is also vital to preserve as much of the distal knee joint as possible in order to maximize post-operative function of the joint. In transtibial amputations, longer post-operative stumps improve metabolic efficiency . In fact, post-operative stumps measuring less than 3 cm after below knee amputation severely compromise the function of the existing knee joint and render a below knee amputation unfeasible, making above knee amputation necessary . In this case report, R. A. had a segmental defect of his tibia with the remaining proximal tibia measuring 2.5 cm. This length is insufficient to fit a below knee prosthesis properly, and the next level for an appropriate prosthesis is above the knee. The challenge was to provide an amputation that would alleviate his chronic osteomyelitis while avoiding an above knee amputation. As the tissues of the distal leg were healthy, it was decided that this tissue could be used to provide the patient with a longer limb proper below knee prosthesis and lead to superior function as well as decreased energy expenditures for the patient. In order to utilize the distal leg in an attempt to lengthen R. A.’s limb proper, a rotationplasty was performed. Rotationplasty has been traditionally used as a limb salvage technique in osteosarcoma . However, its use to ameliorate the effects of traumatic injuries is rarer. Unfortunately, this procedure is commonly overlooked due to cosmetic concerns regarding the attachment of the ankle to the knee joint. However, in 2014, Bernthal et al. concluded that cosmetic outcomes of rotationplasty had no appreciable impact on social or emotional function of the patient . It has also been shown that rotationplasty-type procedures are not correlated with any long-term psychological squelae . In this case, R. A. was able to benefit from a rotationplasty by lengthening the distal attachment to his knee in his left lower extremity. By lengthening R. A.’s proximal tibia, the function of R. A.’s knee joint was maximized and application of prosthesis to the left lower extremity distal to the knee was made possible. Below knee amputations are preferable to above knee amputations due to the improved rehabilitation, higher patient satisfaction, and lower energy expenditures. If amputation is necessary, steps should be taken to spare the knee joint and perform the amputation at the most distal point possible on the lower extremity. However, if the site of amputation is unable to be achieved below the knee joint due to the site of the lesion, traditional below knee amputations become unfeasible. Here we report a case where the patient’s osteomyelitis of the left tibia necessitated removal of significant portions of the left, proximal tibia leading to a segmental bone defect. A rotationplasty was successfully employed to use the patient’s distal leg to lengthen the post-surgical stump and spare the knee joint. This case shows the effectiveness of the rotationplasty in its ability to lengthen the functional limb and optimize the utilization of prosthesis. As part of a multi-disciplinary team, orthopaedics, plastic surgery, infectious disease, and medical services successfully provided a unified front for an individualized treatment plan and ultimately obtain ultimate function for R. A.’s left lower extremity. Here we report a case where an above knee amputation was avoided by conducting a rotationplasty to provide the patient with a below knee amputation. A rotationplasty may be considered as a viable alternative to above knee amputations in certain cases where the proximal tibia is too short to consider a traditional below knee amputation. 1. 15: The Energy Expenditure of Amputee Gait | O&P Virtual Library. N.p., n.d. Web. 08 Apr. 2015. 2. Bernthal N M, Monument M J, Randall R L, and Jones K B. “Rotationplasty: Beauty Is in the Eye of the Beholder.” Oper Tech Orthop 2014;24(2) : 103-10. Web. 3. Browner B D. Skeletal Trauma: Basic Science, Management, and Reconstruction. Philadelphia, PA: Sauders/Elsevier, 2009. Print. 4. Canale, S. T., and Willis C. Campbell. Campbell’s Operative Orthopaedics. St. Louis: Mosby, 1998. Print. 5. Carvalho J A, Mongon M D, Belangero W D, and Livani B. “A Case Series Featuring Extremely Short Below-knee Stumps”. Prosthetic OrthotInt 36.2 (2012): 236-38. Web. 6. Esterhai JL, Rao N. The epidemiology of musculoskeletal infection. Esterhai JL McLaren AC Orthopaedic Knowledge update: musculoskeletal infection. 2009. American Academy of Orthopaedic Surgeons Rosemon, IL. 7. Gailey R S, Wenger M A, Raya M, and Kirk N. “Energy Expenditure of Trans-tibial Amputees during Ambulation at Self-selected pace.” Prosthetics and Orthotics International 1994;18:84-91. 8. Gustilo R B, Mendoza R M, and Williams D N. “Problems in the Management of Type III (severe) Open Fractures: A New Classification of Type III Open Fractures.” J Trauma 1984;24(8)742-746. 9. Kegel B., M. Carpenter L., and Burgess E M. “A Survey of Lower-limb Amputees: Protheses, Phantom Sensations, and Psychosocial Aspects.” Bull Prosthet Res. 1997;10(27): 43-60. 10. Lew D. P. and Waldvogel F A. “Osteomyelitis.” N Engl J Med. 1997;336(14): 999-1007. 11. Lipsky B. A., Pecoraro R E, and Wheat L.J.. “The Diabetic Foot. Soft Tissue and Bone Infection”. Infect Dis Clin North Am 1990;4(3): 409-32. 12. MacKenzie E J, Bosse M J, and Castillo R C. “Functional Outcomes Following Trauma-Related Lower-Extremity Amputation”. The Journal of Bone and Joint Surgery 2004; 86(8):1636-645. 13. Meffert, R. et al. Distraction OsteogenesisAfter Acute Limb-Shortening for Segmental Tibial Defects COMPARISON OF A MONOFOCAL AND A BIFOCAL TECHNIQUE IN RABBITS. JBJS 2000; 82(6). 14. Nadeem P,, Dutta P, Ray P, Shah V N., Prakash M, Khandelwal N, et al. “Microbial Profile and Utility of Soft Tissue, Pus, and Bone Cultures in Diagnosing Diabetic Foot Infections”. Diabetes Technology and Therapeutics 2012;14(8):: 669-74. 15. Katherine R A. “Prosthesis Use in Persons with Lower- and Upper-limb Amputation”. The Journal of Rehabilitation Research and Development 2008;45(7): 961-72. 16. Rao N., Ziran B H, and Lipsky B A. “Treating Osteomyelitis: Antibiotics and Surgery”. Plastic Reconstructive Surgery 2011;127: 177-87. .
17. Balachundhar S, Pomposelli F, Talmor D, and Park K W. “Perioperative and Long-Term Morbidity and Mortality After Above-Knee and Below-Knee Amputations in Diabetics and Nondiabetics”. Anesthesia & Analgesia 2005;100(5):: 1241-247. 18. Norbert S P., Barbey N, Veuskens A, Tempka A, Haas N P, Hoffmann R, and Tscherne H. The Incidence of Osteitis in Open Fractures: An Analysis of 948 Open Fractures (A Review of the Hannover Experience)”. Journal of Orthopaedic Trauma 1993;7(5): 473-82. Web. 19. Heinrich T A, and Hofmann G O. “Principles of the Therapy of Bone Infections in Adult Extremities.” Strategies in Trauma and Limb Reconstruction 4.2 (2009): 57-64. Web. 20. Waters R L, Perry J, Antonelli D., and Hislop H. “Energy Cost of Walking of Amputees: The Influence of Level of Amputation. n. pag. Web. J Bone Joint Surg Am. 1976;58(1):42-6. 21. William W W, BlindtSegraves K, and Michael S A. “Current and Lifetime Incidence of Psychiatric Disorders among a Group of Extremity Sarcoma Survivors.” Journal of Psychosomatic Research 1986;30(2): 121-25.